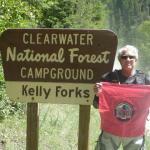 Tucked away in a heavily wooded, stream-side location at the confluence of Kelly Creek and the North Fork of the Clearwater River in Northwest Idaho, is Kelly Forks Campground. With 14 campground sites, a group area, campground host and a hiking trail going directly up to Flat Mountain from the site, horseback riding trails in the vicinity, swimming and an abundant watchable wildlife, Kelly Forks has a little of everything. Also, for all the anglers out there, Kelly Forks boasts a blue ribbon cutthroat trout stream (one of the best-kept fly fishing secrets in Idaho—catch and release). It is a remote location and truly a place where you will feel like you have the river all to yourself. The area’s trailhead provides access to Little Moose Ridge Trail #760 which rolls from saddle to peak following a ridgeline 9 miles to connector trails, while Kelly Creek Trail #567 follows Kelly Creek and its tributaries for 22-1/2 miles. It’s an easy grade with scenic meadows with the last 3 miles climbing steeply toward the Bitterroot Divide. 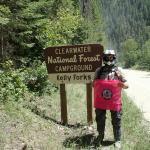 Kelly Forks Cabin is located within the Kelly Forks compound, an active Forest Service Work Center. It is believed to have been built in the mid-1930s, and was originally used as a stopover between the Upper North Fork and the Bungalow Ranger Station. The cabin, which can be rented from the Forest Service, sleeps six people and comes with a full-size bed with mattress, two twin beds with mattresses and two full-size futons. A flush toilet and shower are provided. The kitchen area is equipped with a propane cook stove, electric microwave, propane refrigerator, coffee maker and a table with chairs. A stove with a propane insert heats the cabin. Peak season at the cabin is from mid-June through the end of September. Photo taken July 10 on group ride with Arden Hill & Doug Patchin. Went north on the road from Kelly into Montana. fun ride.